Recently I’ve been reading a few posts across the search and social blogosphere touching on the issue of philanthropic campaigns within the digital industry. I’m always interested because it’s often about helping a worthy cause through the simplest of methods. If I can help out, why wouldn’t I? (NB. If there were ever any Catholics in my family ancestry, I definitely inherited their guilt. Taoist family guilt maybe?). It’s also often the root of some of the more innovative ideas around. One post that got me thinking was by Justin Kownacki, entitled People Are Desperate to Care About Something. Is It You?. His remarks centre on humans’ natural inclination to want to help, and how we can cash in on that through strong imagery. He does make a good point: the general populous do want to care, they want to feel that they’ve helped a good cause so why not give them the imagery and the method to do so? It’s a trick that has worked for years – buy this washing up liquid with this very cute child on the front of it. It’s 50p more than your standard choice but 40p of that extra cost will go to charity. It’s no major impact on my shopping bill and it’ll help out those cute kids clearly portrayed on the front of said washing up bottle. They’re age-old marketing tactics that may be as subtle as a sledge hammer but let’s face it – the brand makes their money, they help out a good cause that wouldn’t otherwise get that help and the consumer gets both the product they want and the smug satisfaction of knowingthey’ve done a good deed that day. Who’s the loser? The #AmericaWants hashtag campaign driven by USA Today from earlier this year where the charity with the most retweets was awarded with a full-page advert in the newspaper. The NYC Foursquare leaderboard/Pepsi joint venture to donate four cents to CampInteractive for every Foursquare check-in within the NYC district. Zynga’s limited edition virtual pet, the ‘Gulf Coast Turtle‘, which could be purchased by users of their popular game Fishville; with half of all proceeds going to to the Audobon Society to help with the clean up of animals affected by the oil spill. Now I’m no white angel when it comes to SEO by any means, sometimes you just have to get your hands a little dirty. However it seems to me there’s a win/win situation here that not enough people are taking advantage of – which is in no way shady nor does it require half the amount of painstaking link building efforts some ideas do. Philanthropy meets link building. Although the above campaigns may be a good use of social media, only a fraction of all those links, PR and tweets go back to the main site itself. There is opportunity here to combine the campaign with some direct link building. Building a little on some of the ideas that Lisa Myers used in her talk on ‘How to Use Social Media for SEO‘, it’s not about forgetting the social aspect of it, it’s about rethinking a little more laterally to also increase pure SEO benefit. The great thing about a charity-focused link building campaign is it is so easy to find your linkbait angle. Take the Pepsi/CampInteractive charity combination for example. Pepsi have absolutely nothing to do with the cause but they fund it because it is all about getting their brand out there. Consider the kind of competitions, articles, giveaways you would normally look to push as linkbait, then add in the charity angle. If you have a travel client, don’t just write loads of destination guides or offer one free trip in a competition. Team up with a charity and build your content around that. So you have a client who offers holidays to South America? Get in touch with someone like Toy Box Charity, ask them to provide content for your site, build a landing page around their content, run a competition – for every five entries, a child is sponsored by your travel client and the winner receives a box of ethically sourced gifts from Toy Box, or that free holiday you were already thinking about using for a competition anyway. It’s linkbait with a difference, and the linkerati are already pre-disposed to be more interested in this idea because it’s about helping a worthy cause, you can’t just ignore that. Last week Pedigree did a great example of this, combining two of the link builder’s most used assets – a giveaway and the blogger community. 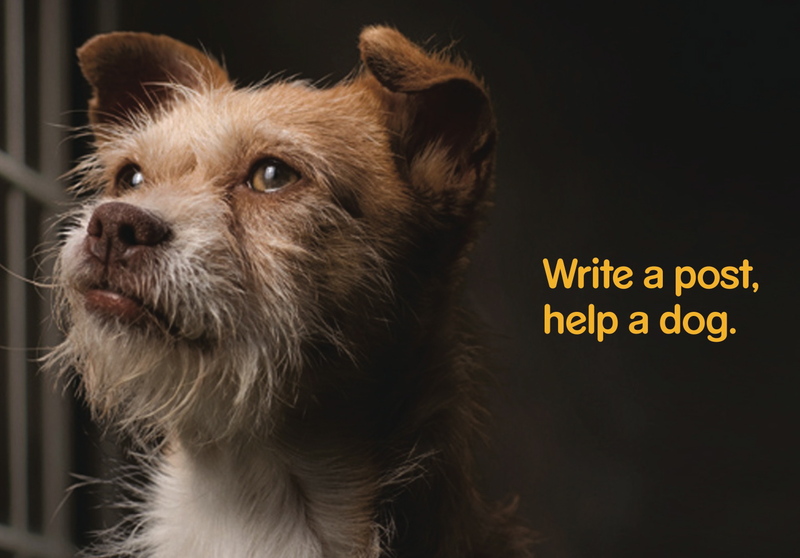 They launched their ‘Write a Post, Help a Dog’ campaign encouraging people to write a blog post about the company’s adoption programme, promising to donate a twenty-pound bag of dog food to a shelter for every post written. Dogs happy, bloggers happy, Pedigree adoption programme page linked up to the max. Hundreds of brand new posts indexed (and links back) later, the dogs are fed and the Pedigree brand is splashed across the internet. Not bad for letting others do all the written work! Social media was also not forgotten, and the brand pledged to donate a further one bowl of dog food for every ‘Like’ it received on its Facebook page. 1. It’s for charity, doh! Sometimes it just feels good to do the right thing! Forget white hat/black hat and all those ethics, it helps more than just you. 2. People are desperate to care about something – it’s linkbait with an added bonus. These days influential bloggers know they have power. But can they really turn down the opportunity to help out a good cause when it’s a win/win situation for all? 3. There is a wider audience available to you. Unlike standard campaigns, you are not only appealing to your direct community of customers, you are also appealing to those who are interested in the charity and the cause. It does not have to be about your product anymore. Although you want links back, you also want the campaign to succeed. Allow for flexibility, don’t dictate anchor text or force people to give you a deep link back to the right page. Suggest it, encourage it but allow for give and take. It’ll give you a more natural profile in the long run, and won’t kick off warning signs with your audience. You want to help a good cause but bother to find out who it is you’re helping. Get to know them, get them fully involved and build up a relationship, they’re your partner and your key to the success of both brand visibility and link gain so treat them as so. As with any other campaign, target your PR well. You’ve researched your cause not get to know who supports it and get to know them. Make sure you push your campaign out through the best people. There must be a dedicated section on your site for your campaign. Promote it on your homepage, ensure it is optimised so your site is found if your campaign is searched on. Make it appealing and informative, people should want to link to it because it is the best landing page for the job. Social media may not be your prioity in this case but that doesn’t mean it’s not a great tool. Remember to build that Facebook page, let the twitterverse know and integrate all areas of social media with your campaign. As Kownacki says, we won’t care unless we see it. Don’t hold back – get those pictures up there. Think about what pictures best encapsulate the message you are trying to get across. On that note, allow me to introduce to The Panda Trust , the only charity focusing on promoting the ecological benefits of saving the panda’s natural habitat, and therefore their survival in the wild, rather than breeding pandas in captivity that will never be re-introduced. Trying to Reverse Engineer the Google Algorithm is a Futile Exercise. Ultimately, the only reason we do anything is to feel better or to avoid reproach. Philanthropy is a good way for a person (or a company) to do both. And even when philanthropy seems forced or obscure — like tacking a company name to a charity simply because a company needs a charity to publicly support — it’s the best kind of accident. If nothing else, more attention will be paid to that cause simply because that company stood next to it in a crowded attention economy. If we lived in a culture where people proactively spent more of their income on charity than on merchandise, we might all feel many magnitudes better about ourselves. But that’s an unlikely and untenable fantasy. On the other hand, when companies take charities under their wing, we’re allowed to live vicariously through their arrangement by supporting brands we already utilize and causes we believe in. As far as capitalism goes, that’s the closest thing we have to a win-win situation. Completely agree with Justin. To me, the ethical issue is a non-starter. It’s true that you may be (ab)using the charity and its cause for your own good. However they are also benefiting from your work and would not otherwise potentially get that same exposure you and your brand can offer them. It’s not philanthropy in the traditional sense. It is put-on and forced to some extent. Charities themselves are a money-making business, they are more than willing to be used because they know it’s good from them. Relating that back to SEO, and Jeroen’s comments, yes there should be a certain amount of subtlety. You don’t want to proclaim to the world that you’re really just looking for links, then again you woudn’t do that with any decent link bait campaign! Although it may sound callous – I feel using charities for link building purposes provides strong enough benefits to both parties to balance out the concern over their being ‘used’. I like the angle you’re getting at in this post. I never really thought of using philanthropy this way. Of course you are right when you say companies have been (ab)using it for a very long time in offline marketing. And yes, you are offering consumers a platform to ‘do good’. Personally, I find it very distasteful when it’s really obvious what the actual cause of the campaign is (their own sales). When you use philanthropy this way your company and brand should be subordinate to the cause you’re supporting. As with offline campaigns, in online campaigns the key here should be subtlety. Just as you´re saying in your final list: don´t dictate how people participate in your campaign. Still I’m left a little bit confused whether I think this is good SEO or bad SEO (let me think about it a little more). But it’s definitely creative SEO! Annabel, this is a great example of creative SEO and showcases how traditional marketing / philanthropic thinking can be combined with the once standalone concept of SEO. SEO in 2010 is about online visibility – Effective SEO campaigns should really be based on wider marketing/sales goals, not just the positions of one or two core rankings. IMO the argument if this type of ‘faux philanthropic’ practice is white / black SEO is irrelevant – as this is not about SEO, this is about age old ethical marketing dilemmas which will always generate mixed opinions. It’s a great tactic and works wonders in regards to paying for links. No need to feel bad about using charities to get links…charities spend most of their money on marketing and other frivolous things anyhow..so who cares. Business is about making money, period. I agree to some extent Ryan, charities aren’t stupid and know they are need to make money too. However there is a part of me that enjoys the philanthropic angle as well. I’ve no qualms involving charities to get links, but I’d like to think I’m doing a little good somewhere along the line too. Have my cake and eat it. “Helping a worthy cause through the simplest of methods” — Yes! I once organized a charity event to benefit animals hurt by the Gulf oil spill and when I promoted it through social media, I had a tremendous response. To use philanthropy for link building is an interesting tactic as long as individuals don’t take advantage of it. So Link Building can have a heart. It’s pretty much the same reason why companies have Corporate Social Responsibility programs–it’s a win-win situation for all, and it makes you look good. Howdy, Excellent article! Very well written and straight to the point. I am using some of this article in my own papers as a guide, I hope you don’t mind. No problem Amy, glad to be of help. If you could just reference appropriately, that would be great. Thanks!